The FedEx Cup playoffs are about to start, and two Old Palm Golf Club residents have qualified to compete. 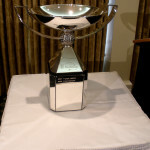 Louis Oosthuizen, winner of the 2010 British Open, and Charl Schwartzel, 2011 Masters champion, are among the worldâs Top 125 players in the Fed Ex Cup standings, making them eligible for the playoffs. Schwartzel safely moved from the bubble spot at 125th to 96th after finishing tied for third in last weekendâs Wyndham Championship. Oosthuizen sits comfortably at 28th. The four-event playoffs feature a progressive cut, beginning with The Barclays tournament, which starts this Thursday in Edison, New Jersey. The Deutsche Bank Championship and BMW Championship follow, after which the field will be narrowed to the Top 30 players. Those 30 players will then compete in the finale, the TOUR Championship by Coca-Cola, where the Fed Ex Cup Champion will be crowned and win a staggering $10 million.